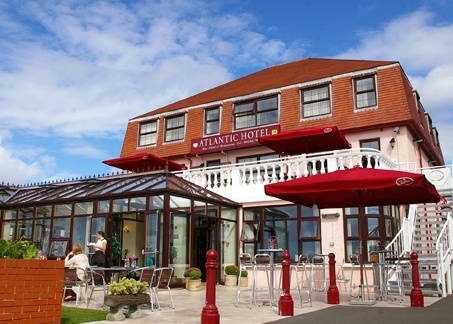 The Atlantic Hotel is conveniently situated on the sea front within a few minutes walk of the town centre and the picturesque harbour, on the unspoilt coast of Porthcawl. A few minutes walk in a westerly direction is Locks Common leading to the extensive sands of Rest Bay. The hotel is ideally placed whether you are visiting the area for pleasure or business, sited midway between the South Wales cities of Cardiff and Swansea, near to Bridgend and Port Talbot. The hotel is the perfect base for a golfing holiday in Wales with a choice of several golf courses in Porthcawl. "One of the most friendly places I have ever stayed at - great welcome for golfers"